I applaud the actions of the Alabama State Legislature and passage of HB170, which has now officially become law. The new law defines pharmacists as health care providers and it is an important step to help pharmacists improve patient care in this great state. In particular, I wish to thank Susan Alverson and the Alabama Board of Pharmacy for putting forward this important legislation, and I’m grateful for the tremendous support of Representative Elaine Beech and Senator Billy Beasley. 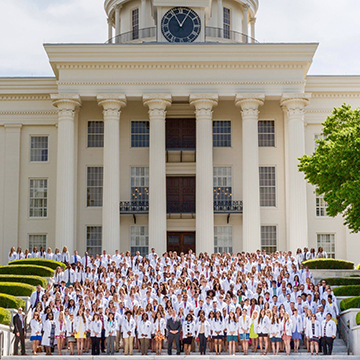 Earlier this year in April, I had the privilege to stand on the capitol steps in Montgomery alongside more than 350 Samford University McWhorter School of Pharmacy students and faculty. We were advocating for the profession of pharmacy and improved patient care. This advocacy as well as work done by professional state pharmacy organizations and individual pharmacists has helped our profession take this major step. This new law is important for two reasons. First, it better aligns state regulations with pending national bills that if passed would identify pharmacists as health care providers within the Social Security Act. Likewise, the new state law may facilitate insurance coverage for pharmacy care services. It is important to realize this is the first of many necessary steps. The new law represents the foundation upon which we can expand patient care provided by pharmacists in this state (e.g., collaborative practice). I am incredibly proud of what has been accomplished, and I look forward to collaborating on additional work to be done.